under the small umbrella: Turtle soup? Optimum Releasing has just released a poster, images and the UK trailer for their upcoming 3D animated adventure, 'A Turtle's Tale: Sammy's Adventure's in 3D'. The trailer does go a bit "The Mother of all Trailers" on you at the start. A spectacular 3D animation following the wonderful adventures of Sammy the sea turtle (Dominic Cooper, MAMMA MIA) as he searches the ocean for his one true love. Sammy scrambles to the sea shortly after hatching on a beach in California and quickly finds and loses the love of his life, the beautiful Shelly (Gemma Arterton, TAMARA DREWE). 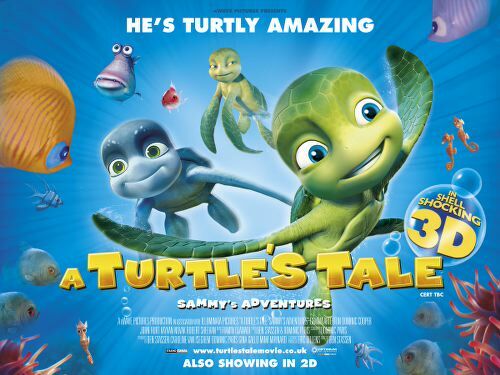 During the epic journey which all turtles accomplish before returning to the beach where they were born, Sammy dodges every possible danger; he battles with piranhas, escapes a fish eagle and searches for a mysterious secret passage, in the hope of meeting Shelly again.